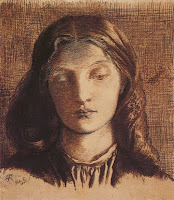 Another, more tragic muse for Dante Gabriel Rossetti was his wife, Elizabeth Siddal. She was the model for many of Rossetti's early paintings, the model for Millais's Ophelia, and also a painter and poet herself. Although her family was neither wealthy nor educated, she learned to read and write and began a love of poetry after finding a Tennyson poem on a scrap of newspaper that had been used to wrap butter! After Dante Gabriel Rossetti met "Lizzie," she became the model for all his paintings of women and stopped posing for the other PreRaphaelites. They fell in love and became engaged, but Rossetti, who feared his family's disapproval of Lizzie's working class background, repeatedly postponed the wedding. Their engagement lasted for over ten years, during which Lizzie became increasing depressed and frail. They finally married, and honeymooned in France. However, Lizzie remained ill and had become addicted to laudanum (an opiate that was legal at the time and used by many Victorian-era women as an "elixir"). She became pregnant but the child was stillborn. She overdosed on laudanum shortly after a second pregnancy ~ whether her death was accidental or a suicide is not clear. 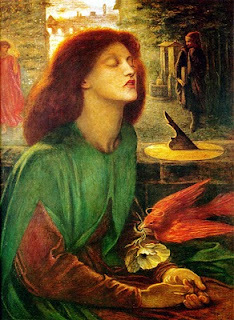 Dante Gabriel Rossetti mourned her loss deeply, and buried his journal containing the only copies of many of his poems with her, tucked into her long red hair. The journal was later recovered from her coffin and the poems published ~ something which haunted him the rest of his life. Rossetti adored and idealized Elizabeth Siddal in his paintings and writings. It is difficult and dangerous to pass judgment on another person's love, but perhaps if he had seen her more as a real woman ~ rather than as an idealized medieval maiden or, at the other end of the spectrum, the working class girl his family scorned ~ they could have been happier. Thank you so much for the interesting art history. So sad that often times we let ourselves be led by other's opinions instead of what our hearts feel. Such a sad story.